The Powerstop and Vaughn Gittin Jr. Ford Mustang gets an interior overhaul with a cage and other mods. The start of a new Project: An over the top giveaway drift Mustang. 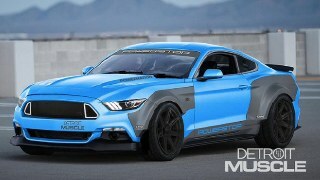 With some help from Pro Drifter and Mustang RTR Founder Vaughn Gittin Jr., the Detroit Muscle crew takes on one of their wildest projects yet. 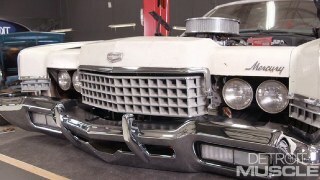 How do you get tons of power out of an already stout factory coyote motor? Supercharge it! 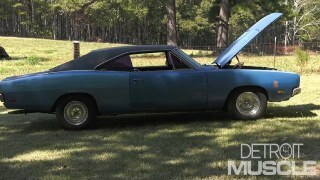 Plus how to build the drivetrain to handle nearly 700 ponies to the wheels! 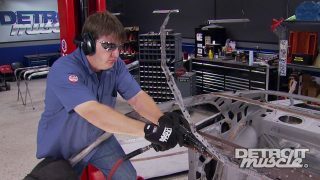 'The guys do some body mods to the Powerstop and Vaughn Gittin Jr. 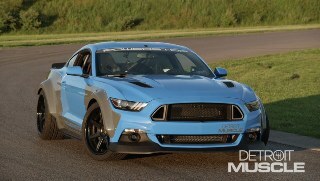 Ultimate Ford Mustang, then head to Gridlife to where Vaughn himself tests out its capabilities. 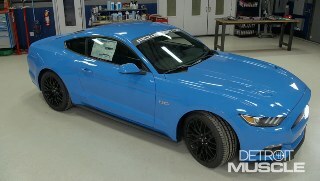 (NARRATOR)>> TODAY ON DETROIT MUSCLE WE'RE GONNA GET BACK ON OUR POWERSTOP AND VAUGHN GITTIN JUNIOR ULTIMATE FORD MUSTANG WITH SOME INTERIOR MODS THAT'LL MAKE HER SAFER AND UPGRADE THE PERFORMANCE. 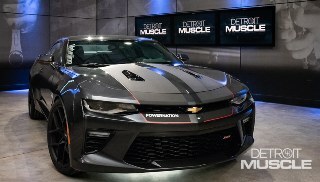 (MARC)>> HEY FOLKS, WELCOME TO DETROIT MUSCLE. TODAY WE'RE JUMPING BACK ONTO OUR POWERSTOP ULTIMATE MUSTANG. WE'RE ABOUT HALF WAY THROUGH THIS PROJECT NOW AND WE'VE ALREADY DONE MOST OF THE PERFORMANCE UPGRADES. 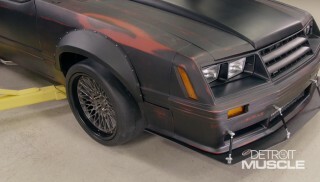 (TOMMY)>> WE'RE TEAMING UP WITH PROFESSIONAL DRIFTER VAUGHN GITTIN JUNIOR ON THIS BUILD. 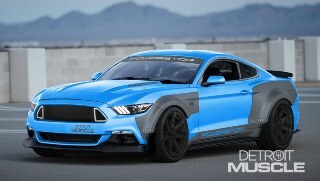 HE WIELDS HIS OWN MUSTANG IN FORMULAD BUT HAS HELPED US DESIGN THE POWERSTOP ULTIMATE MUSTANG. 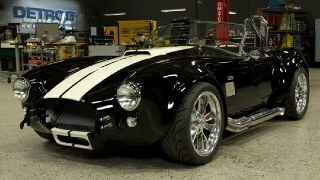 A TRACK READY STREET STANG THAT YOU'LL HAVE A CHANCE TO WIN ONCE WE'VE FINISHED IT. (MARC)>> NOW AS FAR AS THIS INTERIOR GOES, WELL FORD'S DONE AN AMAZING JOB WITH THIS S-550 MUSTANG. AS FAR AS THE ERGONOMICS AND CREATURE COMFORTS GO IT DOESN'T REALLY GET ANY BETTER THAN THIS UNLESS YOU MOVE TO LIKE A LUXURY CAR, BUT THEN AGAIN THIS IS A MUSTANG. IT'S NOT MADE FOR LUXURY, IT'S MADE FOR DRIVING. NOW IF YOU'RE JUST DRIVING TO THE GROCERY STORE OR USING THIS THING AS A COMMUTER, THIS STUFF IS PERFECT, BUT IF YOU'RE GONNA BE DOING THE KIND OF THINGS THAT WE'RE GONNA BE DOING SOME OF THIS STUFF HAS TO GO. SO WE'RE GONNA GIVE THIS INTERIOR A COMPLETE OVERHAUL. (TOMMY)>> NOW WE'RE GONNA BE INSTALLING SEVERAL UPGRADES ON THE INSIDE OF OUR MUSTANG, AND THE FIRST THING THAT WE'RE GONNA ADDRESS WAS KIND OF ON THE SAFETY SIDE OF THINGS. SO WE GOT US A ROLL BAR FROM WATSON RACING. NOW THIS IS A FULLY MANDREL BENT AND TIG WELDED TOGETHER UNIT. NOW THIS PARTICULAR SETUP ACTUALLY BOLTS INTO THE CAR. 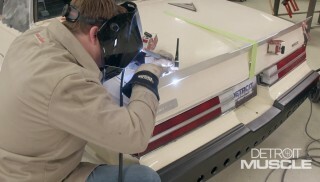 THERE ARE SOME WELD INS OUT THERE AND YOU COULD DO IT TO THIS ONE AS WELL, BUT WELL WHEN YOU DO THAT THIS THING IS KIND OF LIKE PERMANENT, AND WE LIKE THIS BECAUSE LATER DOWN THE ROAD IF WE WANTED TO TAKE IT OUT, WELL WE COULD. NOW WE'VE GOT TO TAKE QUITE A BIT OUT ON THE INSIDE OF THE CAR. SO LET'S GRAB SOME TOOLS AND GET A LITTLE BUSY. 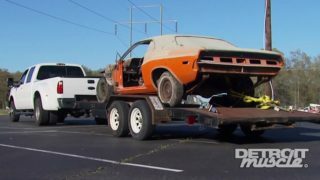 (MARC)>> WE ALL KNOW HOW HANDY A BACK SEAT CAN BE, ESPECIALLY IN A MUSTANG IF YOU WANT TO TAKE A ROAD TRIP, BUT SINCE WE'RE GONNA BE INSTALLING THAT FOUR POINT ROLL BAR THIS THING'S GOT TO GO. ...THE DRIVER'S SEAT CAN COME OUT. THE REAR SEAT BOTTOM JUST UNSNAPS AND LIFTS RIGHT OUT. THE REAR SEAT BACKS ARE INDEPENDENT, AND BOTH SIDES UNBOLT ON THE OUTWARD SIDE. THEN JUST SLIDE RIGHT OFF THE CENTER PIVOT BRACKET. (MARC)>> WELL WITH THE REAR SEAT OUT OF THE WAY WE CAN NOW MOVE ON TO GETTING THESE TRIM PANELS OUT BECAUSE THEY NEED TO BE REMOVED TO GET THE MAIN HOOP OF THE ROLL BAR INSTALLED, BUT WHILE WE'RE AT IT WE'RE TAKING THE SEATBELTS OUT AS WELL AS THIS HARDWARE THAT HELD THE REAR SEAT IN BECAUSE WE'RE GONNA INSTALL A REAR SEAT DELETE BACK HERE. IF YOU HAVE A REAR SEAT DELETE YOU DON'T NEED SEATBELTS, BUT WE ARE GONNA SAVE ALL THIS STUFF CAUSE WHOEVER WINS THIS CAR CAN PUT THE BELTS AS WELL AS THE SEATS BACK IN. THE INTERIOR TRIM PANEL IS HELD IN BY PRESSURE CLIPS AND CAN BE REMOVED BY HAND. THESE THREE BOLTS NEED TO COME OUT ON BOTH SIDES BECAUSE THIS IS WHERE OUR MAIN HOOP IS GOING TO BE BOLTED IN. THERE MAY BE SOME SEAM SEALER IN THE WAY, BUT NOTHING A SCRAPPER CAN'T HANDLE. (TOMMY)>> THE MAIN HOOP CAN GO IN THE CAR NEXT. THIS IS A TWO PERSON JOB BECAUSE YOU DON'T WANT TO SCRATCH THE ROLL BARS. 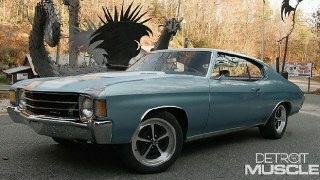 GOTTA GO YOUR WAY A LONG WAYS, AND BE CAREFUL FISHING IT IN AROUND THE WIRING HARNESSES. THESE LONGER BOLTS CAME WITH THE ROLL BAR, AND JUST GET STARTED BY HAND FOR NOW. THE DOWN BARS CAN GO IN FOR A PREFIT, AND ONCE THEY'RE SNAPPED INTO PLACE THE HOLES GET TRACED ONTO THE TRUNK FLOOR. (MARC)>> WE'LL STEP UP OUR BITS UNTIL WE'VE MADE THE HOLES LARGE ENOUGH AND CLEAN UP ALL THE SHAVINGS. THAT SEAM SEALER CAN GO AWAY, AND WITH TOMMY UNDER THE CAR WE'LL GET THOSE BRACKETS INTO PLACE. (NARRATOR)>> COMING UP, WE'VE GOT SOME NO NONSENSE SEATS AND A BIG STEERING WHEEL UPGRADE. (TOMMY)>> HEY GUYS, WELCOME BACK. WELL WE'RE ABOUT MID STROKE OF INSTALLING THE ROLL BAR INTO OUR MUSTANG. THE NEXT STEP IS GONNA BE INSTALLING SOME OF THE INTERIOR PANELS. NOW WITH THIS ROLL BAR IN PLACE WE'RE GONNA HAVE TO WHITTLE ON THEM JUST A LITTLE BIT BUT THAT'S NO BIG DEAL. YOU KNOW WE'VE GOT PLENTY OF TOOLS AROUND HERE TO CUT ON STUFF. THE FIRST PIECE THAT WE'RE GONNA GET TO WHACKING ON IS THIS REAR SIDE PIECE. WE'RE GONNA HAVE TO TRIM DOWN HERE AT THE BOTTOM SOME. NOW OUR INSTRUCTIONS TELL US EXACTLY WHERE WE NEED TO CUT. SO LET'S DO A LITTLE MARKING AND WE CAN GET TO SLICING. (TOMMY)>> THE TRUSTY OLE BODY SAW WILL MAKE QUICK WORK OF THIS AND ALLOW US TO MAKE CONTOUR CUTS. WE'LL USE A FILE TO CLEAN UP THE EDGES AND A UTILITY KNIFE TO REMOVE THE SMALL BURRS. AND IT'S READY FOR A TEST FIT. PUTTING THE PANEL BACK INTO THE CAR WITH THE MAIN HOOP IN PLACE TAKES A BIT OF ACROBATICS, BUT IF YOU'RE CAREFUL WITH IT AND WORK REAL SLOW IT JUST SNAPS RIGHT IN. (MARC)>> WITH THOSE TRIM PANELS BACK IN THE CAR IT'S TIME TO START THINKING ABOUT OUR SEAT DELETE. SO WE GOT THIS ONE FROM FORD PERFORMANCE. 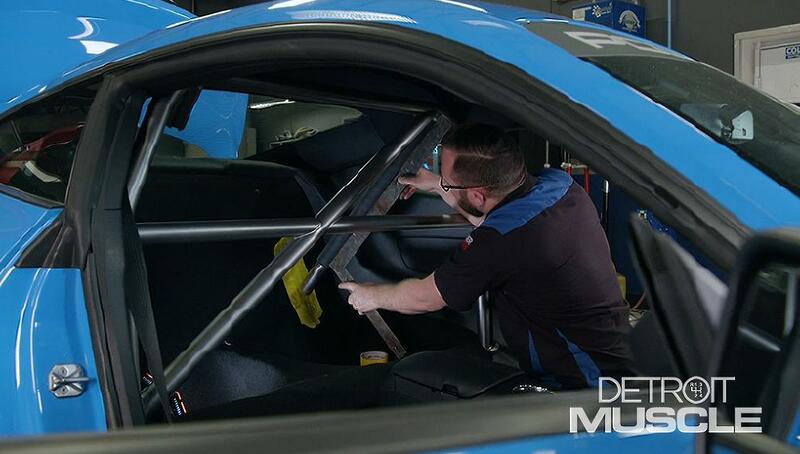 WHAT'S REALLY NICE ABOUT IT IS THIS IS THE SAME SEAT DELETE THAT COMES FROM THE FACTORY IN THE SHELBY GT 350-R. SO WE KNOW THAT IT'S GONNA FIT JUST RIGHT. IT COMES WITH ALL THE HARDWARE TO GET IT INSTALLED AS WELL. NOW WE ARE GONNA HAVE TO MODIFY THIS ONE SLIGHTLY TO FIT AROUND OUR ROLL BAR, BUT IT SHOULDN'T BE TOO BAD. (MARC)>> A LITTLE BIT OF SAW WORK AND IT'S READY TO FIT INTO THE CAR. WE FOUND IT EASIEST TO JUST FISH IT INTO THE CAR THROUGH THE TRUNK, AND ONCE IT'S IN IT FITS LIKE A GLOVE. TWO BOLTS AND IT'S DONE. WELL NOW IT'S TIME TO FIGURE OUT WHERE WE NEED TO MAKE OUR HOLES IN THE SEAT DELETE WHERE THE DOWN BARS WILL GO THROUGH. WELL WE COULD USE A PIECE OF PVC PIPE HERE OR SOMETHING LIKE THAT, BUT I GOT THIS PIECE OF HOSE WITH SOME INCH AND THREE QUARTER OD TUBING HERE, AND WE'RE JUST GONNA PUT IT IN PLACE AND MAKE OUR HOLE. I NEED TO MAKE SURE THIS IS STRAIGHT. (TOMMY)>> AND MARC EVEN HAS A REVOLUTIONARY WAY TO REMOVE THOSE SHAVINGS. WE'LL FISH THOSE DOWN BARS THROUGH THE NEW HOLES FROM THE TRUNK AND GET THEM SITUATED INTO PLACE. (MARC)>> A RUBBER MALLET GETS THEM LINED UP, AND THE BOLTS HOLD IT ALL TOGETHER. BACK IN THE TRUNK WE CAN INSTALL THE BOLTS THAT HOLD THE DOWN BARS TO THE FLOOR FOR THE FINAL TIME AND GET THE TRIM PANELS BACK IN. (NARRATOR)>> STICK AROUND TO FIND OUT JUST HOW EASY IT IS TO INSTALL A SET OF BOLSTERED RACING SEATS IN YOUR RIDE. (TOMMY)>> HEY GUYS, GLAD YOU COULD MAKE YOUR WAY BACK. NOW WE GOT OUR ROLL BAR BOLTED IN OUR MUSTANG AND THE NEXT UPGRADE THAT WE'RE LOOKING AT INSTALLING ARE OUR SEATS. NOW WE GOT THESE FROM FORD PERFORMANCE, AND THEY HAVE SEVERAL BENEFITS TO THEM. NOW OBVIOUSLY YOU CAN SEE THAT THEY'VE GOT THE BOLSTERED SIDES, AND SINCE WE'RE BUILDING US THAT SLIPPY SLIDEY CAR, THESE ARE ALMOST A MUST. THE NEXT THING THEY HAVE ARE THESE PROVISIONS UP HERE IN THE HEADREST FOR THE SEAT BELT HOLES, OR A HARNESS IF YOU WILL. NOW WHENEVER YOU DON'T HAVE THESE, OFTEN TIMES THEY PUT THEM HERE ON THE SIDE AND THE HARNESS FALLS OFF, AND THAT'S A SAFETY ISSUE. NOW SPEAKING OF SAFETY, THESE SEATS ALSO HAVE THE FACTORY STYLE AIR BAGS IN THEM. SO SWAPPING THEM AROUND, WELL YOU'RE NOT SACRIFICING SAFETY EQUIPMENT. NOW ANOTHER BENEFIT TO THESE SEATS IS THAT THEY'RE A DIRECT BOLT IN. SO THERE'S NO FABRICATION REQUIRED. THE NEXT THING WE NEED TO DO BEFORE WE BOLT THESE IN IS GET THE BELTS IN PLACE. (MARC)>> WELL I WENT AHEAD AND GOT OUR SHOULDER HARNESSES INSTALLED HERE IN THE CAR, AND THESE ARE GONNA BE GREAT FOR THE TRACK, BUT WHEN IT COMES TO THE STREET WE CAN JUST USE OUR REGULAR SEAT BELT HERE. WHAT'S GREAT ABOUT THESE IS THEY WRAP AROUND THIS BRACE THAT'S BUILT INTO OUR ROLL BAR. IT'S ACTUALLY MADE FOR THESE HARNESSES. IT EVEN HAS THESE LITTLE BRACKETS HERE THAT KEEP THEM FROM SLIDING LEFT AND RIGHT WHEN YOU'RE IN THE CAR. IT'S GONNA KEEP YOU TIGHT IN THE SEAT AND SAFE AS WELL. NOW WITH THESE INSTALLED WE CAN MOVE OVER TO THE SEATS, GET THOSE LAP BELTS INSTALLED. (TOMMY)>> NOW TO MOUNT ONE SIDE OF OUR FOUR POINT HARNESS LAP BELT WE'RE GONNA USE THIS FACTORY LOCATION. NOW IT ISN'T THAT COMPLICATED. WE'RE JUST GONNA TAKE THE BOLT OUT, TAKE THE OTHER PLATE OF THIS THING, AND SANDWICH BETWEEN, AND USE ONE OF THESE ARP BOLTS, AND WE'RE ALSO GONNA USE A LITTLE BIT OF THREAD LOCKER TO MAKE SURE IT DOESN'T GO ANYWHERE. (MARC)>> ON THE OUTSIDE HERE IT'S GONNA BE A LITTLE BIT DIFFERENT. WE ACTUALLY DON'T HAVE THE PROVISION HERE TO MOUNT THE BELT BECAUSE THE SEAT BELT'S MOUNTED UP ON THE BPILLAR. SO WHAT WE'RE GONNA DO IS USE THIS EXISTING SEAT MOUNTING BRACKET HOLE. WHAT'S GOOD ABOUT THAT IS IT'S A GOOD, STRONG MOUNTING POINT. IT'S USING A LONGER BOLT THROUGH THE HARNESS, AND THEN WE'RE GONNA USE THESE SPACERS HERE. THAT'LL GET IT UP ABOVE THE SEAT MOUNT WHERE IT'LL BE NICE AND CLEAR, BOLT THAT THROUGH THE SEAT, AND THAT'LL JUST GO IN WHEN WE INSTALL THE SEAT. (TOMMY)>> THESE SEATS WILL BOLT TO OUR FACTORY HOLES IN THE FLOOR. THESE ARE VERY SIMILAR TO THE SEATS THAT COME IN A RECARO OPTION CAR. WE'LL GET THOSE HARNESSES BOLTED IN AS WELL AND TIGHTEN ALL THE BOLTS. (TOMMY)>> NOW WE CAN FISH OUR SHOULDER HARNESSES THROUGH THE HOLES IN THE SEATS, AND WE'RE GOOD TO GO. (MARC)>> NOW SINCE WE'RE TALKING ABOUT SAFETY, YOU WANT TO MAKE SURE YOU WEAR THESE THINGS PROPERLY. SO YOU HAVE TO SET YOUR SEAT FIRST BECAUSE ONCE YOU GET THESE THINGS TIGHT THEY'RE NOT GONNA MOVE. SO NOW THAT I'VE GOT THAT SET, WE GET THE LAP BELTS TIGHTENED FIRST. MAKE SURE THAT'S LOW AND TIGHT OVER YOUR WAIST, AND ONCE THOSE ARE CINCHED DOWN THEN YOU CAN MOVE ONTO THE SHOULDER BELTS AND GET THOSE LATCHED IN AND CINCHED DOWN. THAT'S ALL THERE IS TO IT. I THINK THIS INTERIOR NEEDS A COUPLE OF MORE THINGS THOUGH. 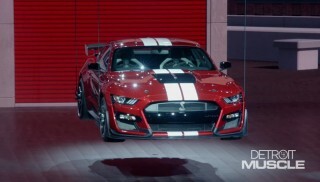 (NARRATOR)>> AFTER THE BREAK WE'RE GONNA PLUG IN A GT 350-R STEERING WHEEL. 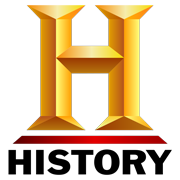 (MARC)>> HEY FOLKS, WELCOME BACK. WE'RE BUSY PLUGGING AWAY ON OUR POWERSTOP ULTIMATE MUSTANG AND WE'VE BEEN UPGRADING THE SAFETY COMPONENTS ON OUR INTERIOR, LIKE THESE SEATS, HARNESSES, AND A FOUR POINT BOLT IN ROLL BAR. NOW WE'RE GONNA MOVE ON TO SOME AESTHETIC PIECES, LIKE THIS STEERING WHEEL THAT WE GOT FROM FORD PERFORMANCE. THIS IS THE SAME WHEEL THAT COMES STOCK IN THE SHELBY GT 350-R AND IT'S A REALLY NICE PIECE. IT'S LEATHER AND ALCANTARA WRAPPED, BUT TO INSTALL IT YOU NEED TO REMOVE THE AIR BAG. THAT'S WHERE THIS GETS KINDA TRICKY. SO IT COMES WITH THESE INSTRUCTIONS AND IF YOU JUST LOOK HERE, THERE'S PAGES OF WARNINGS HERE BECAUSE AIR BAGS ARE DANGEROUS. YOU DON'T WANT THE AIR BAG TO BLOW UP IN YOUR FACE. YOU ALSO DON'T WANT TO PERMANENTLY DISABLE THE AIR BAG SYSTEM. SO THEN IT WON'T WORK IN CASE YOU NEED IT IN AN ACCIDENT. SO THESE INSTRUCTIONS ARE VERY IMPORTANT. THE FIRST THING IT TELLS YOU TO DO IS REMOVE THE FUSE THAT POWERS THE AIR BAG MODULE. I'VE ALREADY DONE THAT. SO NOW I CAN JUST CYCLE THE KEY TO MAKE SURE THAT IT'S OFF, AND THEN DISCONNECT THE BATTERY. (TOMMY)>> THIS THREE MILLIMETER HEX WRENCH IS THE PERFECT TOOL TO REACH THE CLIPS THAT HOLD THE AIR BAG IN. ONCE IT'S OUT WE CAN UNPLUG THE THREE CONNECTORS THAT TIE IT TO THE AIR BAG MODULE. ONE BOLT HOLDS THE WHEEL ON BUT YOU HAVE TO FISH THE CLOCK SPRING HARNESS THROUGH TO GET IT OFF. WE'LL PUT A PIECE OF TAPE ON IT TO KEEP THE ROTOR FROM SPINNING, WHICH COULD DAMAGE IT. (MARC)>> WE'LL USE A TORKS BIT TO REMOVE THE SCREWS THAT HOLD ALL OF THE TRIM PIECES AND STEERING MOUNTED SWITCHES TO THE WHEEL. ONCE WE GET THEM UNSNAPPED THE SWITCHES GET UNCLIPPED AND SET ASIDE. (MARC)>> WE NEED TO REMOVE THE SWITCHES FROM THE TRIM PANELS BECAUSE WE'RE GOING TO REPLACE THEM WITH THESE THAT CAME WITH OUR FANCY NEW WHEEL. THE SWITCHES GO ON USING THE SAME HARDWARE, AND THE TRIM PANELS AND SWITCHES CAN ALL BE INSTALLED ONTO THE WHEEL, AND SCREWS GO BACK IN. (MARC)>> THAT PIECE OF TAPE CAN GO AWAY AND THE WHEEL SLIPS RIGHT ON. WE'LL GET EVERYTHING BACK IN BY REVERSING OUR REMOVAL PROCEDURE AND BEING CAREFUL WITH THAT AIR BAG. WELL I THIS THING'S READY TO GO WITH THAT STEERING WHEEL ALL IN NOW. WHAT ARE YOU DOING? (TOMMY)>> SORRY, WITH MARC BEING BUSINESS DOING THE LIGHT WORK AROUND HERE IT'S TIME FOR ME TO STEP IN AND DO A LITTLE MORE OF THE HEAVY HITTING KIND OF THING. WE'VE GOT THIS SHIFT KNOB FROM RTR. LET ME GET THIS THING ON. (TOMMY)>> MAN YEAH! ALMOST GOOD ENOUGH THAT YOU COULD DRIVE IT. (TOMMY)>> HEY GUYS, WE'VE GOT A SUBJECT THAT WE WANT TO TOUCH ON TODAY BECAUSE WE'VE HAD A COUPLE OF EMAILS AND I'M SURE A FEW OF YOU HAVE SEEN US USE THIS THING IN THE SHOP. IT'S AN OXY ACETYLENE CUTTING TORCH. NOW IT'S A PRETTY PRIMITIVE TOOL BUT IT'S PRETTY HANDY TO HAVE AROUND. WHETHER YOU NEED TO HEAT A FEW THINGS UP OR IF YOU NEEDING TO DO A TID BIT OF CUTTING. NOW THERE'S SOME SAFETY PRECAUTIONS THAT YOU NEED TO DO BEFORE YOU GET TOO CARRIED AWAY. WHENEVER YOU GO TO MOUNT YOUR REGULATOR THEY KIND OF SET IT UP SO THAT IT'S KIND OF FOOL PROOF. NOW IF YOU'LL NOTICE THAT THE THREADS ON THIS, I'M ACTUALLY TURNING THE NUT OR STUD KIND OF BACKWARD. WELL IT'S GOT LEFT HANDED THREADS TO KEEP YOU FROM MESSING UP. IN ADDITION TO THAT, ON THE OXYGEN SIDE, IF YOU NOTICE THIS HAD ACTUALLY GOT FEMALE THREADS TO IT, AND THESE ARE RIGHT HANDED. THAT HELPS TO KEEP YOU FROM GETTING THEM MIXED UP. WHENEVER YOU GO TO TIGHTEN THESE THINGS UP YOU DON'T GOTTA GET LIKE HULK ON IT. YOU JUST WANT TO SNUG THEM UP GOOD. NOW WE CAN CHECK FOR LEAKS. THE FIRST THING THAT YOU WANT TO DO IS TURN OFF THE KNOBS HERE ON YOUR TORCH HEAD, AND THEN YOU CAN CRACK OPEN THE BOTTLES. NOW WHENEVER YOU GO TO CHECK FOR THE LEAKS YOU CAN USE WATER AND SOME DISH SOAP IN A SPRAY BOTTLE AND SPRAY HERE AT ALL THE JOINTS. IT'S THAT SIMPLE. ALL RIGHT, WE LOOK LIKE WE'RE IN PRETTY GOOD SHAPE. SO WE CAN MOVE ON TO CHECK THE ACETYLENE BOTTLE. OH WE ABOUT OUT! AND LOOKS LIKE WE'RE IN PRETTY GOOD SHAPE THERE AS WELL. SO NOW WE CAN MOVE ON TO ADJUSTING THE REGULATOR. TO DO THAT WHAT YOU WANT TO DO IS CRACK OPEN THE KNOB TO WHICHEVER BOTTLE YOU'RE TRYING TO ADJUST, AND THEN JUST SIMPLY TURN THIS KNOB. THAT GIVES YOU THE MOST ACCURATE READING. NOW AS A RULE OF THUMB YOU'RE LOOKING FOR ABOUT SEVEN PSI. HERE ON THE OXYGEN SIDE YOU'RE LOOKING FOR 40 PSI. WE'RE JUST A LITTLE BIT LOW. (TOMMY)>> WELL THAT PRETTY MUCH DOES IT FOR YOUR BASIC SETUP ON BOTTLES AND REGULATORS, AND WE'LL DIG A LITTLE DEEPER ON SETTING UP YOUR TORCH NEXT TIME. GENERAL MOTORS BACK IN THE '60'S AND '70'S ADDED A BIT OF DETAIL ON THEIR AIR CLEANER LIDS WITH SOME AGGRESSIVE DECALS. NOT ONLY DID IT ADVERTISE THE ENGINE DISPLACEMENT, BUT IT ALSO JAZZED UP UNDER THE HOOD. CLASSIC INDUSTRIES HAS TAKEN THAT EVEN FURTHER BY OFFERING THESE CROSS FLAG AND TURBOJET DIE CAST EMBLEMS. THEY'RE SHAPED TO HAVE A NICE FIT, AND WITH A SIMPLE ADHESIVE BACKING IT DOESN'T TAKE MUCH TO INSTALL THEM. SO IF YOU'RE LOOKING FOR SOME JEWELRY TO GO ALONG WITH YOUR BOW TIE, CLASSIC INDUSTRIES HAS YOU COVERED.